Engineers at University College London (UCL), with colleagues in France and Spain, have developed a silicon oxide memory chip that is faster can operate in ambient conditions. The discovery is described online in the Journal of Applied Physics (paid subscription required), and a patent has been filed for the technology. The team led by UCL electrical engineering professor Tony Kenyon designed a Resistive Random Access Memory or ReRAM chip whose electrical resistance changes when a voltage is applied. Moreover, the chip retains this change in resistance even when the power is turned off. 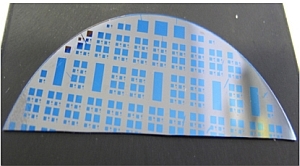 The chips is made of silicon oxide, using a new type of structure that performs the switch in resistance much more efficiently than has been previously achieved. The arrangement of silicon atoms in the chip’s material changes to form filaments of silicon inside the solid silicon oxide, which are less resistive. The presence or absence of these filaments represents a switch from one resistance state to another. Unlike other silicon oxide chips currently in development, this chip can work in normal environmental conditions, rather than needing a vacuum to work, and is therefore potentially cheaper and more durable. The greater efficiency and ability to work in ambient conditions indicate that the ReRAM chip devised by Kenyon’s team is more durable and can operate with less energy and space. “Our ReRAM memory chips need just a thousandth of the energy and are around a hundred times faster than standard flash memory chips,” says Kenyon. The UCL researchers added an extra capability, continuously variable resistance that depends on the last voltage that was applied. These devices are known as memristors, and can mimic the way neurons function in the brain. The first practical memristor, developed in 2008, says the university, was made of titanium dioxide. The development of a silicon oxide memristor is considered an important advance because of the potential for its use with silicon chips. Kenyon says the team is developing a quartz-based chip — the mineral quartz is made of silicon dioxide — that would give the device the potential for use in transparent applications, such as computer or smartphone touch screens. Adnan Mehonic, a doctoral engineering student and first author of the paper, says that during proof of concept stage of the project, the team was able to program the chips using the cycle between two or more states of conductivity. “The potential for this material is huge,” says Mehonic. UCLB, the university’s technology transfer office, has filed a patent for the chip. The office reports that discussions about the chip are ongoing with a number of semiconductor companies.